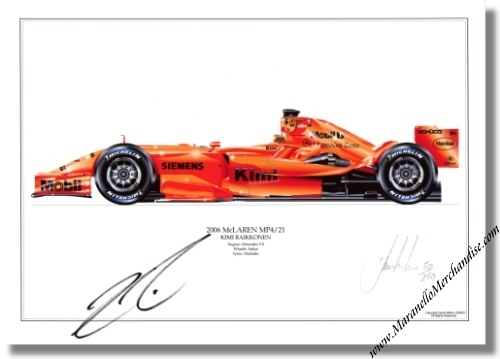 Kimi Raikkonen & David Wilson signed McLaren MP4/21 'Presentation' 2006 print. This is a limited edition David Wilson print of Kimi's MP4/21 in presentation livery. The print has been signed by both the artist as well as by "The Iceman" himself. The print is part of a limited run of 250 pcs. and this is number 50 of those 250. The print measures approximately 12 x 8 inches or some 30 x 20 cm (A4 Size).